Last Dollar Road view from just south of Point B. This is the springtime view. In the fall those aspens turn gold. That's a private ranch road down there—Last Dollar Road is behind you. Last Dollar Road GPS Map. 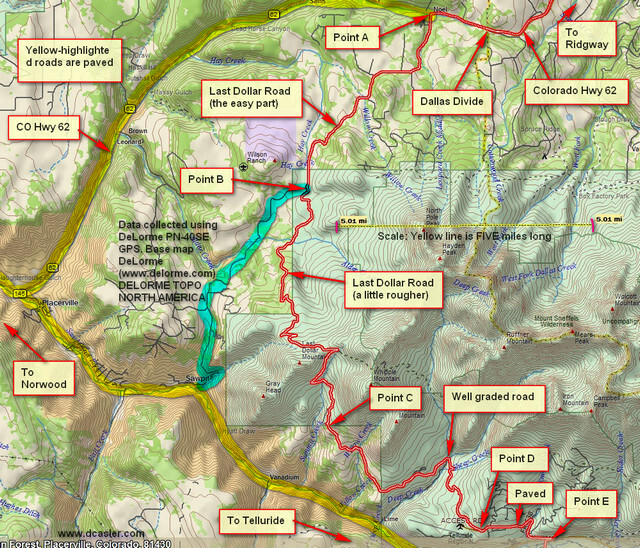 The paved roads from Ridgway and Norwood to Telluride are highlighted in yellow. The blue highlight is the well-graded road down into Sawpit. See text for Points A through E.
I traveled from north to south, though you can easily do it the other way. 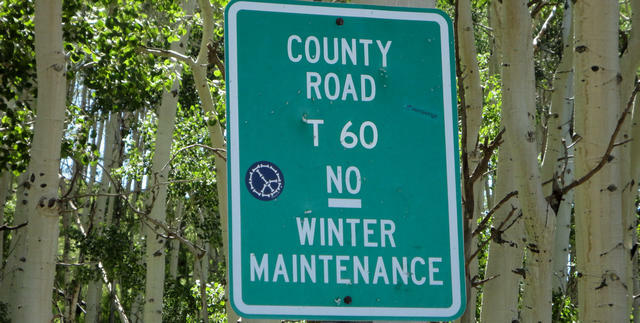 The road is well-marked and easily-located, about a mile west of Dallas Divide on Colorado Hwy 62. The turnoff is marked as Point A. The road is well-graded and travels up a canyon and comes out atop a mesa. The Last Dollar Ranch (see next photo) is right there. Last Dollar Ranch entrance. That's the west end of the Sneffels Range in the background. The ranch is private property. This is the road sign at Point B. To continue on Last Dollar Road, you want to go east toward the mountains. From this point on the road is a little rougher. Last Dollar Road sign at Point C, looking north. It marks it as San Miguel County Road T60. Last Dollar Road sign, also at Point C. It's on the other side of the road from the sign shown in the previous photograph. From Point C to Point D is a well-graded road, winding around big trophy homes. You can bet each of these buildings cost many millions of dollars! At Point D you encounter pavement and you’re very near the Telluride Airport, which you’ll see below you. If you happen to be traveling from south to north, the sign in the picture below tells you where to turn for Last Dollar Road. 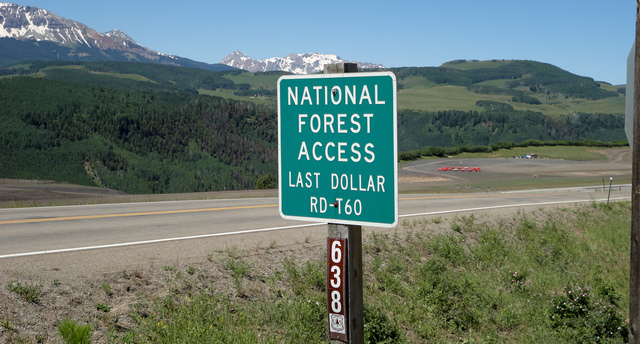 Last Dollar Road sign near Telluride Airport, as seen traveling from south to north. From Point D to Point E the road is paved. Point E marks the intersection between Last Dollar Road and CO Hwy 145. 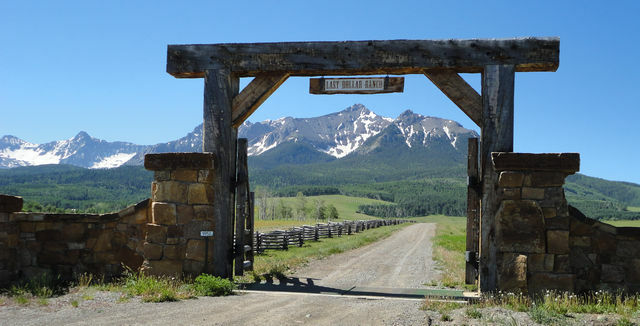 If you’re on 145 going into Telluride (or coming out), you’ll see the sign shown below, which is easy to find. Last Dollar Road sign on CO Hwy 145 near Telluride. Easy to find, it's also the sign to the airport. Note: If you’ve traveled from Point A to Point E, at Point E you will want to turn left (east) to go to Telluride. If you want to go over Lizard Head Pass, you will turn RIGHT (west) and then at the very next intersection (not very far), turn left (south) to follow CO Hwy 145 to Ophir Pass, Lizard Head Pass, and beyond. This entry was posted in GPS Tracks, Motorcycling, San Miguel County and tagged last dollar road, Telluride. Bookmark the permalink. We all loved youe videos of the Colorado Rockies Dave, your camera shots were just great. What a stabilizer you have! The bike was on some really rough roads yet your head-mount camera was steady as a oak tree. What band do you use on your radio? We are new to HAM, in fact I am looking at radios to find out what to purchase. Three is us are all mounting 160-2 meter Buxcom multiband dipoles in a few weeks. I’ll have an antenna but no radio yet!!! Do you have any reccos?